Hula songs to celebrate the 56th Annual Merrie Monarch Festival at Hilo, Hawaii is the theme for this month’s Sing-Along with Mele Fong series on Thursday, April 18, 2019 from 10 a.m. to noon at Kaunoa Senior Center on Maui. Hula songs to celebrate the 56th Annual Merrie Monarch Festival at Hilo, Hawaii is the theme for this month’s Sing-Along with Mele Fong series on Thursday, April 18, 2019 from 10 a.m. to noon at Kaunoa Senior Center for adults 55 and better on Maui. Learn more about the Merrie Monarch Festival April 21-27 by clicking here. 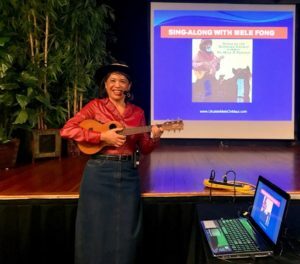 My sing-along program is one of a monthly series that evokes the feeling of sing-along with Mitch Miller programs as the lyrics and ‘ukulele chords are projected on the large screen in the front of room for everyone to follow. ‘Ukulele players are invited to bring instruments to play along as I lead everyone by singing and playing my ‘ukulele while my husband accompanies us on ‘ukulele-bass. Don’t worry if you don’t know the ‘ukulele chords or the unique strumming pattern for the songs. The focus is on singing the songs, finding out the stories behind them, and enjoying the group experience. Why are people returning? “It’s fun!” is what participants have told me. See photos from past classes. Visit my webpage about classes at Kaunoa. Lunch is optional and recommended as a good time to meet people who enjoy learning the Ukulele Mele Way. Kaunoa Senior Center is located in Spreckelsville, Maui. SIGN UP NOW by calling 808-270-7308. 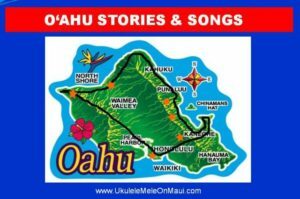 Hawaiian Songs for ‘Ukulele class begins Monday, April 8 at Kaunoa Senior Center on Maui. 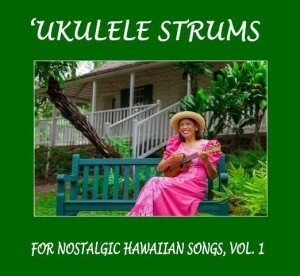 Students can purchase the Nostalgic Hawaiian Songs Vol. 1 packaged song set of Book/DVD/CD in class or download single song lessons to learn the curriculum from wherever you live. HAWAIIAN SONGS FOR ‘UKULELE class begins Monday, April 8 at Kaunoa Senior Center for adults 55 and better on Maui. Class meets 4 consecutive Mondays from 9 – 11 a.m. and ends on April 29. Ukulele players who play C, F, and G7 chords confidently will have more fun. Students will learn to play 6 songs with 5-9 chords and 8 unique strums taught by no one else. Students can review the video lessons, play along with the audio recordings, and follow along with the song sheets outside of class and then ask questions in class. 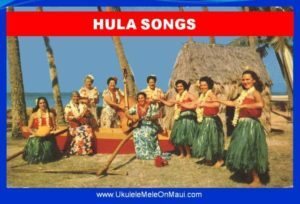 Students can purchase the Nostalgic Hawaiian Songs Vol. 1 packaged song set of Book/DVD/CD in class or download single song lessons to learn the curriculum from wherever you live. BONUS – video stories behind the songs are available with downloadable lesson files only. Aloha ‘Oe: 5-chords with Morse Code Strum. Hula O Makee; 7-chords with ‘Olapa Strum. Kuuipo I Ka He’e Pu’e One; 7-chords with Pick in 4 Strum. Makalapua; 9-chords with I Wanna Rest Strum. Sanoe; 5-chords with Waltz Strum: Thumb Strum Up/Pick in 6 Strum. Two-page song sheets with chords and lyrics (no musical notes to read). Video lesson for how to play the song. Video story behind the song in keeping with Hawaiian oral history traditions. 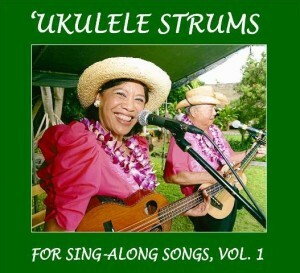 Full audio recording for you to join in singing and playing along with professional musicians The Hawaiian Serenaders. There are a total of 55 single song lessons to choose from for different playing abilities and musical interests. See the summary of songs. Online lessons for 30 days at-a-time are also available. 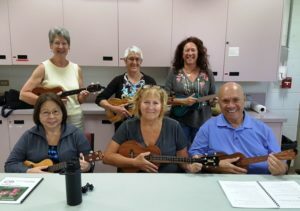 Eight students (2 missing from photo) took Ukulele Mele On Maui’s Ukulele Strumming 101 class in March at Kaunoa Senior Center for adults 55 and better. Eight students signed up for my ‘Ukulele Strumming 101 class scheduled for 3 Mondays from March 4 – 25 (not March 18) at Kaunoa Senior Center for adults 55 and better on Maui. Classes were held 2-hours each Monday and used my Sing-Along Songs Vol. 2 packaged set of Book/DVD/CD with 6 songs with 8 ‘ukulele strumming styles for the curriculum. Students were introduced to my unique method for forming ‘ukulele chord shapes with minimal muscle strain and strumming styles taught by no one else. Camptown Races; 3-chords with Hum Ding-Ah Strum. For He’s a Jolly Good Fellow; 3-chords with Chalang-alang Strum. Medley: Daisy Bell/Sidewalks of New York; 6-chords with Pick in 6 Strum and Waltz Strum: Chicken Pluck Pluck. Sloop John B; 3-chords with Latin Strum. The More We Get Together; 2-chords with 2 Waltz Strums: Thumb Strum Up/Thumb Pluck. When Johnny Comes Marching Home; 4-chords with I Wanna Rest Strum. There are a total of 55 single song lessons to choose from for different playing abilities and musical interests. Learn more here. Beginning ‘ukulele players can also learn from me via online lessons. 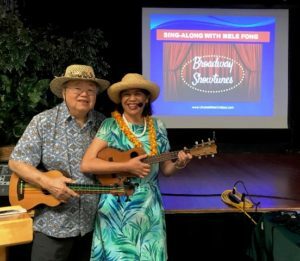 Broadway Show Tunes is the theme for the next Sing-Along with Mele Fong on Thursday, March 14 from 10 a.m. to noon at Kaunoa Senior Center for adults 55 and better on Maui. 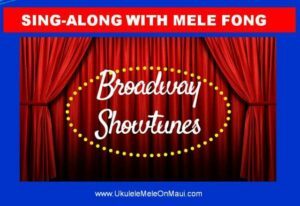 Broadway Show Tunes is the theme for the next Sing-Along with Mele Fong on Thursday, March 14 from 10 a.m. – noon at Kaunoa Senior Center for adults 55 and better on Maui. Whether you are a beginner, intermediate, or advanced ‘ukulele player, you can have fun learning to play the Ukulele Mele Way from wherever you live! ‘Ukulele Strumming 101 class used the Sing-Along Songs Vol. 1 packaged set of Book/DVD/CD with 6 songs and 8 unique ‘ukulele strumming styles taught by no one else. The songs are also available by single song download and online lessons. Thirteen students signed up for my ‘Ukulele Strumming 101 class scheduled for 3 Mondays from February 4 – 25 (not February 18) at Kaunoa Senior Center for adults 55 and better on Maui. Classes were held 2-hours each Monday and used my Sing-Along Songs Vol. 1 packaged set of Book/DVD/CD with 6 songs with 8 ‘ukulele strumming styles for the curriculum. Students were introduced to my unique method for forming ‘ukulele chord shapes with minimal muscle strain and strumming styles taught by no one else. America the Beautiful; 4-chords with Pick in 4 Strum. Clementine; 2-chords with Waltz: Thumb Pluck Strum and Pick in 6 Strum. Down In the Valley; 2-chords with Waltz Strums: Thumb Strum Up/Chicken Pluck. Jamaica Farewell; 3-chords with Latin Strum. She’ll Be Comin’ ‘Round the Mountain; 3-chords with Hum Ding-Ah Strum. Swing Low, Sweet Chariot; 3-chords with I Wanna Rest Strum. 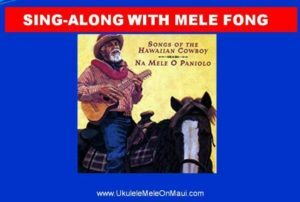 The next Sing-Along with Mele Fong is Thursday, February 21 from 10 a.m. – noon with the theme of Paniolo (Hawaiian cowboy), country, and western songs at Kaunoa Senior Center for adults 55 and better on Maui. Visit my webpage aboutclasses at Kaunoa.